Start your 50km ride at The Wetlands in Flemington Racecourse with a bit of buzz from the event village. It might be early in the morning, but you can expect some dedicated volunteers at the start line to get you geared up and ready to pedal. 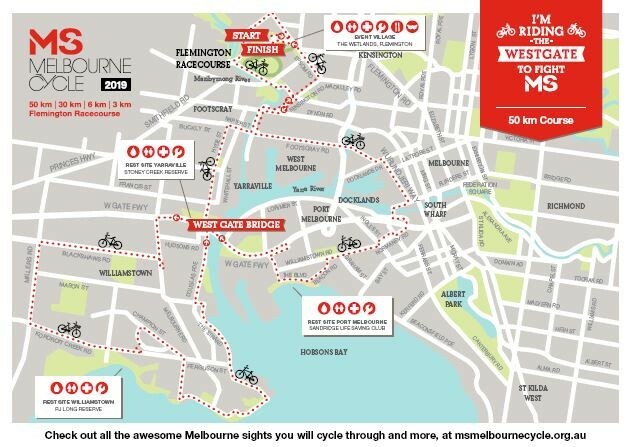 Coming off the bridge, you’ll ride into Williamstown where you can grab yourself a coffee (it’s good, we promise), and jump back on your bike for the last leg of your ride as you return to Flemington Racecourse to our event village. Remember, there are three rest stops along the course that you can jump off at and re energise. We’ve got you covered with water, toilets and first aid facilities at all of them. And don’t stress about getting lost, because there will be 200 volunteer course marshals directing you along the way. Course map may be subject to change.